In Celebration of Women in Business Artist, Gail Ahlers initiated a crowd-funded campaign to honor and give thanks to the Women’s Business Enterprise National Council. Founded in 1997, Women’s Business Enterprise National Council has provided an invaluable network of entrepreneurial women. Thank you Women’s Business Enterprise National Council … By uniting us, you make us stronger, and through your advocacy, we have a voice, and a seat at the table of commerce. The sculpture is made of cut steel and framed in 100-year-old reclaimed lumber. 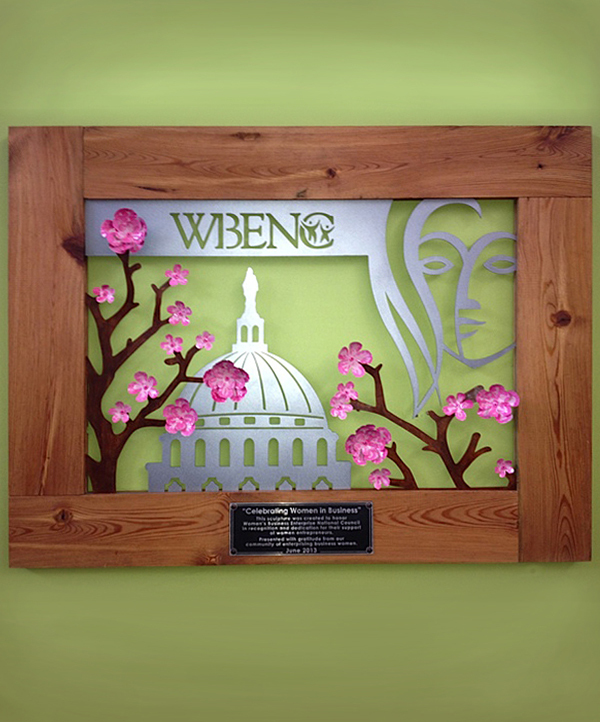 The cherry blossom flowers are crafted from recycled beverage cans and hand painted with eco-friendly pigments.